I share my life with a rescued German Shepherd named Tilly. I take her everywhere with me, on trips across the country and, closer to home, sidewalk cafés, of course. She can go so many places with me precisely because she is a pleasure to be with and around: She lies quietly beside me, bothers no one, and is happy just to be included. Our relationship is deepened by the mutual respect we have and because we can share so much together. 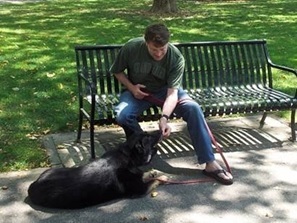 The principles I used to prepare for our lives out in the world together were simple: when I’m walking, she’s walking (loose-leash); when I’m standing, she’s sitting; and when I’m sitting, she’s lying down. I want to help you to shape the kind of relationship with your canine companion that I have with Tilly. For you to do so, practice the steps outlined below. Practice everywhere: at home, in the yard, in parks and sidewalk cafés. While the first stages will require frequent food rewards to keep your dog attentive and working, gradually space out the treats and rely more on verbal encouragement as she becomes more consistent. While heel is an exercise of strict attention and position, “with me!” simply means that your dog should remain close at your side, with a casual attitude. she reaches your side. If she gets out in front of you, say “this way,” turn around and walk in the opposite direction, leaving her behind you so you can again slap your thigh and encourage her to catch up to your side. You should warehouse your treats in your right hand, use your left hand (or near hand) for treat delivery; using your right hand will lure her to cross in front of you. Use your hand for thigh slapping and encouragement, not for luring your dog into position. Otherwise your dog will need to see the treat in order to keep her position. Always treat on the move. Stopping to deliver the treat is not reinforcing moving in position but, rather, stopping. Remember not to use your leash to guide position. Instead, use your voice, use your hand slaps, and increase delivery of treats if your dog’s consistently leaving position. To ensure that you’re not using the leash as a crutch, start practicing inside or in a fenced-in yard, where the leash is unnecessary, and see how successfully you can keep her at your side. When first practicing out on the sidewalk, have a partner hold the leash and follow behind you as you work on motivating your pooch to walk by your side. Keep your practice sessions of this exercise short and positive. Too long and your dog will get distracted and drift around more, and she’ll require more frequent reinforcement to stay focused. 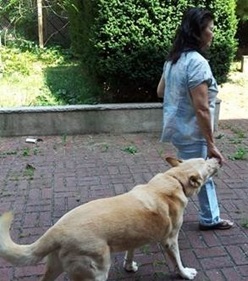 Too often, when people stop on the street, perhaps to chat with a neighbor, their dog is left to conduct herself politely without any instruction from her handler. When things go south and the pooch gets impatient, then the treats come out as hush money. This is reinforcing the absolutely wrong behavior! neighbor. Gradually, over time, you will put greater distance between the treats until at some point you needn’t use treats at all and you won’t have to even cue the sit — she’ll have learned the appropriate behavior when stopping to visit with the neighbors. * For control position, hold the leash’s handle in one hand, letting the middle of the leash drop to the ground. Now step on the leash at a distance from your dog so that she can sit or stand comfortably but cannot jump up. immediately mark the behavior with a “yes!” and give her a treat, conti-nuing to reward at intervals. If she stands up, mark with an “uh!” and abruptly the treats stop flowing. At some point, say “OK” and stand up, allowing your dog to rise. Repeat a few times, making note when your dog begins to lie down sooner. With frequent practice, the down will become a default behavior that is perfect for a canine café companion! The beauty of the default down is that your dog is taking responsibility for her own behavior rather than relying on you to monitor and instruct her politeness. This is a very effective way to build a strong down-stay. A note: If your dog is having difficulty and getting frustrated, use the sit as an intermediate step. When this is solid, start reinforcing for the down instead.